Land Surfer Cruiser skateboards are designed to be the ultimate in form and function, with a variety of head-turning boards and wheel combinations that guarantee you’ll look cool while experiencing a smooth ride. At 22” (56cm) long and 6” (15cm) wide the board is small enough to go wherever you need to take it, but the 20mm non-slip deck is sturdy enough to handle the street. The 59mm wheels and ABEC-7 bearings are smooth and quiet and the easy to control trucks make riding a dream! 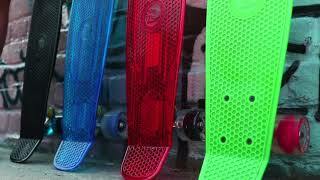 There are many awesome designs to choose from – bright colours, funky patterns and cool transparent boards are paired with LED, transparent or solid colour wheels to make some truly eye-catching combinations! Land Surfer Cruiser boards come with a guarantee of 100% satisfaction – if you are unhappy we will refund you. They also come with an easy to carry skate bag.